I love makeup brushes and while I have plenty on rotation pretty much all of the time, I can never say no to another fluffy brush to add to the collection so when these arrived a few months ago I thought I'd give them a try and see if they live up to the hype of other EcoTools brushes that I'd tried before. Now, my usual top brushes that I reach for every day are either Bobbi Brown, Crown or Real Techniques and while they are my staple picks, I'm also interested to try new brands or brushes to see if they make any big difference to my makeup routine and finish. One problem I always have is finding brushes that are small enough to fit in my makeup bag but don't skimp on quality. Yes, I could probably just invest in those limited edition brush sets that come out every other season from MAC or Bobbi Brown but for throwing in to my makeup bag, I prefer a cheaper option so I've been getting to work with the is little set from EcoTools. 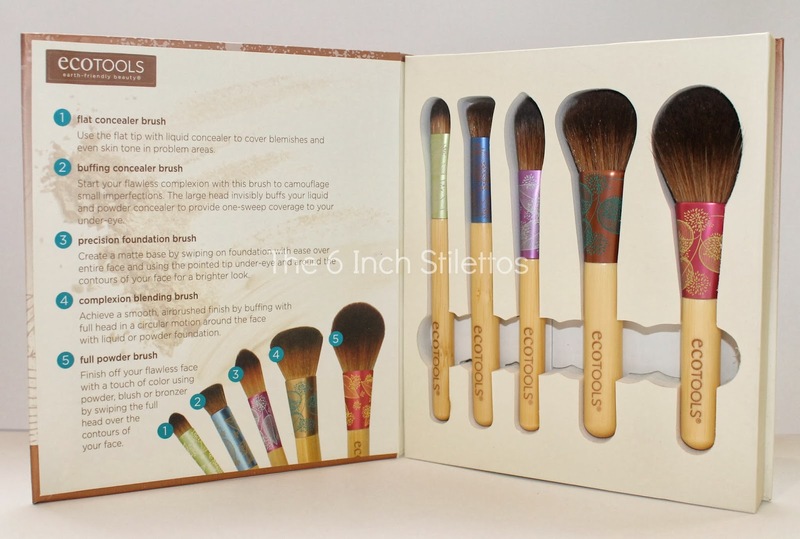 Containing a range of brushes to help buff and blend your makeup to perfection, I found that while they're pretty to look at - I'm a sucker for a pretty brush and the metal ferrule on these brushes is so cute - they're not all as useful as I was hoping which is a bit of a shame. The first brush I pulled out was the Flat Concealer Brush and it was also the first brush that I gave up on because I like to apply my concealer with my fingers as I find it gives me a far better finish than any brush. The Buffing Concealer Brush, on the other hand, was a winner because it's perfect at applying a finishing powder under my eyes to set the concealer as well as buffing out any areas. Next up was the Precision Foundation Brush which is a bit of a pointless brush in my opinion because the brush is far too small to apply a full face of foundation or do touch ups so it's ended up just sitting in my brush pot feeling unloved - Sorry brush. The Complexion Blending Brush and Full Powder Brush are the other two winners in my opinion and definitely deserve the limelight alongside the Buffing Concealer Brush because they do exactly what they say they will. The Complexion Blending Brush is the only brush I take with my on a night out because it's small enough to sit in my clutch bag and it holds powder products perfectly for when I need to powder my nose or buff in some blush. The Full Powder Brush should also get a shout out because it's the perfect bronzer brush and is great for applying an all over bronze but is also small enough to do some light cheekbone contouring - WIN! 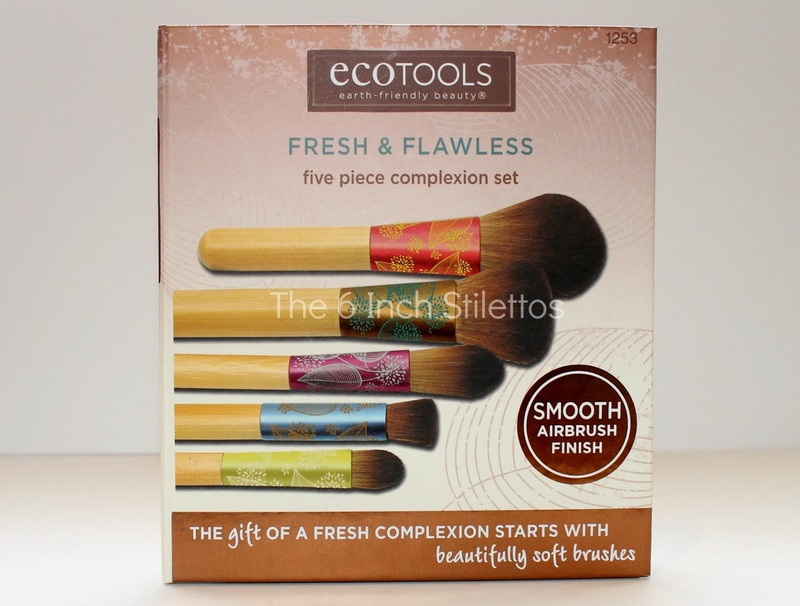 EcoTools Fresh & Flawless Brush Set is priced at £11.99 and available from FeelUnique. I know Anna of ViviannaDoesMakeup is a big fan of these brushes and had the same thoughts as me so it's good to know that I'm not the only one!